Semiya upma is a simple, yet a tasty recipe. 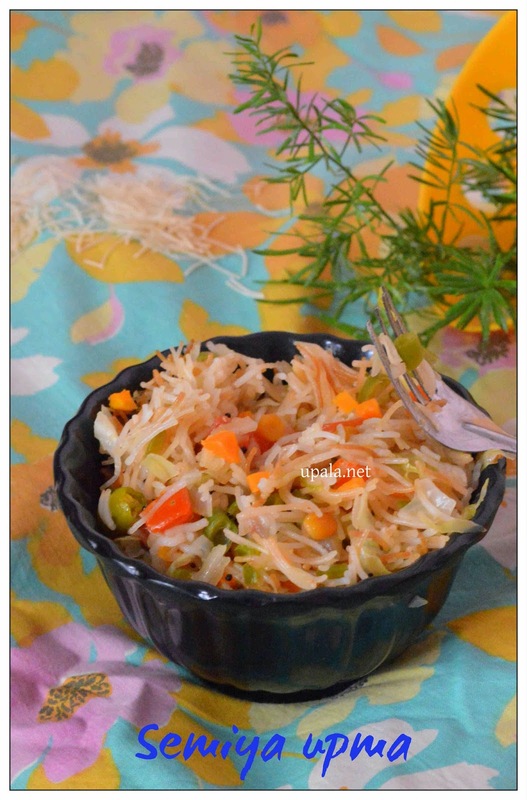 I prepare this vermicelli upma with lots of veggies which makes it more nutritious as well. 1) Heat a kadai and add ghee and cashews, sauté till golden brown. Transfer the fried cashews to a plate. 2) Add Vermicelli in the same kadai with remaining ghee and fry till slight brown colour. Keep aside the roasted vermicelli to cool down. 3) Heat the same kadai with oil, add mustard seeds to crackle. Then add Channa dal, Urad dal, Asafoetida, Red chillies and Curry leaves. Sauté them till dals turn light brown. 4) Add veggies to the seasoning and fry for few mins and add salt and 1/2 cup of water. Close it with a lid and let it cook for few mins. 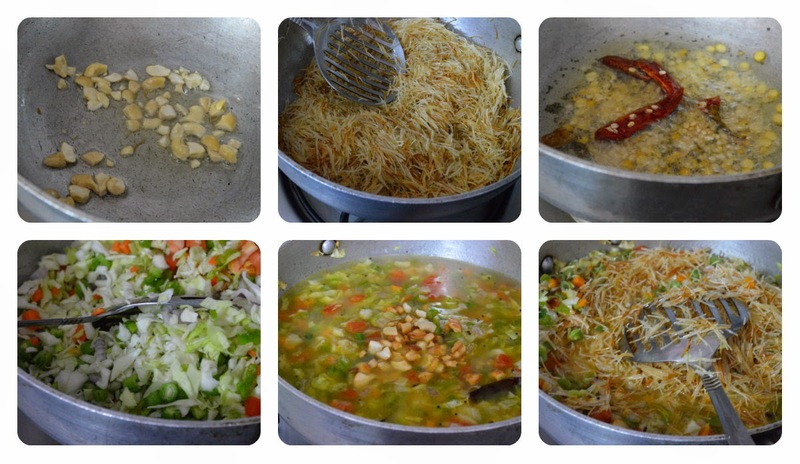 5) Now add rest of the water, fried cashews and vermicelli and mix well. Cover and cook in low flame for few mins till all water gets absorbed by vermicelli. 6) Once the vermicelli gets cooked, switch off the flame and garnish with coriander leaves. 1) Water level depends on the brand of vermicelli you are using, some may take only 11/2 cups and some vermicelli takes 2 cups. Also if your vermicelli is thin it might take less water. 2) As we are adding lots of veggies, it takes some time to cook that's why we are adding water separately for veggies to cook first. 3) If you are using roasted vermicelli, you can skip frying in ghee. 4) Adding 1/2 tsp of lemon juice finally gives tangy taste. 5) Adding green peas with veggies enhances the taste.